Fast Flow Pumps are compact, portable double-suction pump solutions that have been specially designed to produce high flow rates and are ideally suited for tank cleaning, pumping abrasive drill cuttings, and pumping slurry / solids. Our patented submersible, double-suction systems are the only centrifugal pumps that do not have mechanical seals or wear plates and feature no internal friction during operation. Fast Flow Pumps are robust, low-maintenance pumps that feature only three main parts in the form of a top case, bottom volute, and an impeller that does not contact with the pump’s housing. The double-inlet pumps have no internal friction, which allows passage of heavy abrasive slurries and solids with minimal erosional damage. Our self-priming solutions can produce significant flow rates compared to other small submersible pumps, facilitating the conveyance of drilling mud cuttings and environmental waste material weighing up to 20lb per gallon. Fast Flow Pumps have proven consistently reliable and hardwearing in difficult service applications. In the event of rope ingestion or similar interruption, the pump heads’ simple design allows almost anyone to quickly carry out repairs without specialist training or removing them from their place of operation. Fast Flow’s range of pump systems includes units optimised for use in tank cleaning operations, featuring twin inlets that face the tank floor. This pump is able to remove more than 500gal per minute of solids while keeping the level down to where spray nozzles can work effectively in a closed loop system. This speciality pump can maintain the necessary low level at less than 1in, allowing the high-volume 3D spray nozzles to efficiently blast clean the tank bottoms. After reaching the point of low level cavitation a Vac truck can then be connected to the pump discharge to rapidly remove the remaining material from the tank, eliminating the need for slow air diaphragm pumps and air compressor systems at the job site. Our twin-motor bottom suction pumps can handle the low-level cavitation and the constant loading and unloading of the impeller up to many times a minute, and the lack of shaft bearings allows the pump to Run Dry all day without damage. Other pumps that have mechanical seal bearings with internal friction cannot handle the constant hammering and low level cavitation. Fast Flow Pumps are covered under US Patent numbers; 6,942,448; 8,152,443 and 7,442,003, with further patents pending. 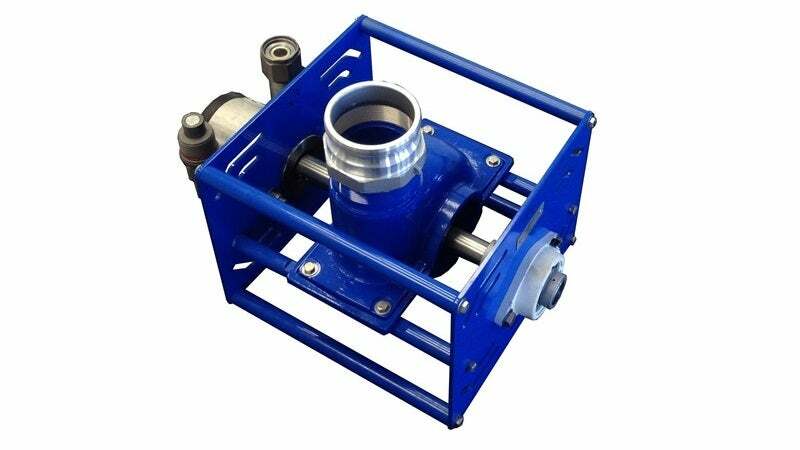 Fast Flow has recently improved its range of ductile iron pumps for processing solids and slurries. These upgrades include doubling the wall thickness of the steel-locking pump case and using aus-temper heat treatment to raise the hardness for pumping abrasive drill cuttings. The 3in model weighs only 42lb and now features an improved impeller designed to pass more solids, achieving maximum water flow rates of 600gal per minute and producing more than 300ft of vertical head pressure. The powerful FF 3 pump head can move 100 barrels of 15lb ‘peanut butter’ drill cement solids in just 12 minutes. Our 4in Fast Flow pump has also been upgraded with a larger 1.5 inch, 17-4 stainless-steel shaft to eliminate the motor shaft couplings, meaning the new improved system is much stronger and features fewer parts for reduced maintenance. The FF 4 can be carried by one person and achieve flow rates of up to 1,000 gallons per minute. Single-motor 4in pumps are installed with larger twin 1.5in shaft bearings to increase the service life of the pump, and we also offer the pump frame in 316 stainless-steel to minimise chlorides and acid attack and this frame is three times stronger than aluminium variants. In addition, even higher flow rates can be achieved using our twin-motor systems. Twin-motor FF pumps do not have any shaft bearings and that enables the pump to run dry all day without damage. Drilling rigs are our largest single customers, and many deploy our single-motor FF 4 to pump ‘well cellars’ loaded with abrasive drill cuttings and drilling cement, that often weigh 20lb per gallon. These devices are also often used in refinery ‘coke pits’, waste pits, power plants, municipal solids, and other severe service pumping applications. Fast Flow’s hydraulic power units (HPUs) incorporate all the most advanced safety, environmental, and maintenance features, and are equipped with oversized oil coolers, piston pumps, and quality flow controls. Our full protection box frame can be Certified meet BP, Shell Oil Lifted Equipment standards and it is Coast Guard offshore / oilfield compliant. Our heavy-lift 1in pad eyes are the same style as the US Navy, it has four-point lift and center point lift pad-eyes. See our full line up on our website. Our HPU has large 10in forklift boots and is also equipped with safety chain binder rings for easy transport. The HPU skid has 100% secondary oil spill containment built-in, low-point drains on all tanks, and double hydraulic oil / fuel filtration. Fast Flow’s oilfield-ready HPU systems are able to power two pumps concurrently or power two 5,000psi explosion-proof hydraulic pressure washers. Fast Flow HPU skids are versatile, multi-purpose systems that can pump solids with one pump, while simultaneously using another pump for impact washing with recycled fluids using 3D spray heads. Fast Flow Pumps is a leading provider of high-performance submersible pumping systems for a wide range of marine applications.